Libec RS-250M Tripod System with Mid-Level Spreader. Includes: RH25 / RT30B / BR-2B / FP-2B / RC-30. The RS-250 series provides a counterbalance range of 1.8 to 5.0kg / 4 to 11lb (height of center of gravity at 100mm / 3.9") and a load capacity of 6kg / 13.2lb. 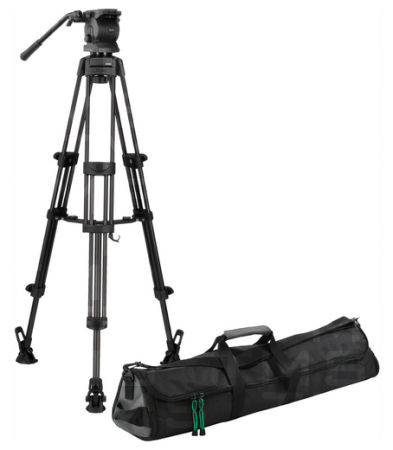 the "variable counterbalance system" enables the tripod head to accomodate many different types of cameras, including hand-held/semi-shoulder HDV, XDCAM IX, P2HD and AVCHD cameras. The RS-250 is a full-fledged tripod head equipped with equivalent panning and tilting capabilities and low-temperature characteristics similar to higer-end models in the same series, but at a more attractive price, making it extremely cost-effective. Height: 80 to 164.5cm / 31.5 to 65"